They had done something that was against the laws of the land, and had been forced to hide themselves in the woods to save their lives. There they spent their time in roaming about among the trees, in hunting the king's deer, and in robbing rich travelers that came that way. 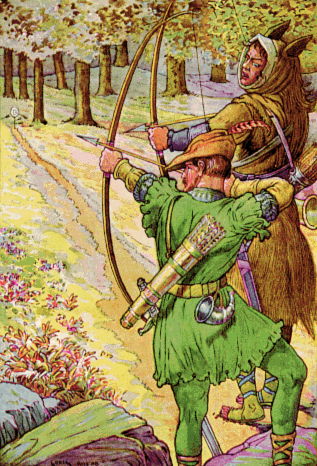 "I will not trouble him," said Robin Hood, "for I think he is on his way to his wedding." "Ah the sad day! the sad day!" he kept saying to himself. "I say, young man! Have you any money to spare for my merry men and me?" "I have nothing at all," said the young man, "but five shillings and a ring." "A gold ring?" asked Robin. "Yes?" said the young man, "it is a gold ring. Here it is." "Ah, I see!" said Robin: "it is a wedding ring." "I have kept it these seven years," said the young man; "I have kept it to give to my bride on our wedding day. We were going to be married yesterday. But her father has promised her to a rich old man whom she never saw. And now my heart is broken." "What is your name?" asked Robin. "My name is Allin-a-Dale," said the young man. "What will you give me, in gold or fee," said Robin, "if I will help you win your bride again in spite of the rich old man to whom she has been promised?" "I have no money," said Allin, "but I will promise to be your servant." "How many miles is it to the place where the maiden lives?" asked Robin. "It is not far," said Allin. "But she is to be married this very day, and the church is five miles away." "Who are you?" said the bishop, "and what are you doing here?" "I am a bold harper," said Robin, "the best in the north country." "I am glad you have come," said the bishop kindly. "There is no music that I like so well as that of the harp. Come in, and play for us." "I will go in," said Robin Hood; "but I will not give you any music until I see the bride and bridegroom." "This is no match," said Robin. "Let the bride choose for herself." "Now whom do you choose?" said Robin to the maiden. "I choose Allin-a-Dale," she said, blushing. "And Allin-a-Dale you shall have," said Robin; "and he that takes you from Allin-a-Dale shall find that he has Robin Hood to deal with." Add A Story of Robin Hood to your own personal library.